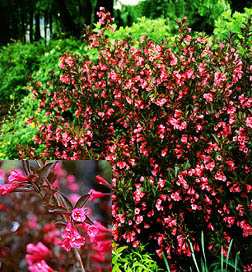 Dark burgundy-purple foliage really show off the rosy-pink flowers, which show in late spring to early summer. Full sun will bring the darkest leaf color. Can attract hummingbirds. Definitely attracts humans. Great planted with perennials and it?s stems and flowers can be used in bouquets. Easy to grow with very few insect or disease problems. Grows to 4-5 feet high and wide. One of the most interesting aspects of this new plant is how it's being used in Europe. The dark purple foliage is so attractive, it is being sold and used as a cut branch in the thriving European floral market. Floral designers are combining Wine & Roses with more traditional cut flowers like roses, baby's breath and chrysanthemums to create uniquely beautiful flower bouquets. Demand is so high in Europe that the world famous Dutch flower auction at Aalsmeer has been selling Wine & Roses for as much as twenty times the price of traditional cut flowers. Wine & Roses is a natural addition to floral bouquets because of its unique color and lasting ability. You can easily combine it with common perennials found in your garden. Try combining Wine & Roses with either Shasta Daisy, Siberian Iris, Globe Thistle, or Russian Sage. The results will simply amaze you.